As School of International Service senior Stephanie Reed watched news of racial tension, grief, and protests this past year, she felt she needed to do something. “Having that be so close to home in Baltimore, that was something I wanted to gain a better understanding of but also help students here have an outlet to discuss those issues,” she said. 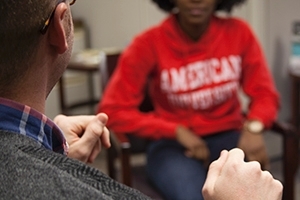 AU staffer Michelle Strange coordinates the dialogues through CDI, which organizes several groups each semester around topics ranging from religion and race to gender identity. She believes students gain a truly distinct learning opportunity in the weekly two-hour, confidential meetings. Strange and CDI form the groups themselves to include participants diverse by race, ethnicity, age, sexual orientation, major, and beyond. That’s what keeps the discussion intergroup, or between various perspectives. For SIS grad student and participant Wes Davison, the intergroup nature is particularly important to the program’s goals—to highlight different personal experiences and stories. As students shared their various perspectives, Reed would watch talkative students sit back in their seats or quiet students step forward to speak—both proud moments for her, seeing her students truly engaging one another in a respectful atmosphere. Even as a facilitator, the semester broke Reed from her particular bubble. “I definitely had to challenge assumptions that I didn’t even know I had,” she said. Davison, a student in AU’s International Peace & Conflict Resolution program, believes that the ability to listen and empathize will be a true asset for group participants in the future. The groups, which wrapped up in November, will begin again in the spring with new topics on equally important and timely topics. In the face of tensions nationwide around social justice issues, Reed sees IGD as way that AU can lead other universities by example. As a staff member in CDI, that’s key for Strange. “It’s important for me to know that the university is valuing this ongoing, proactive conversation that’s about everyone getting together, not just people who think it’s their issue or not,” she said. Looking ahead to the spring, both Reed and Davison have applied to facilitate the next wave of groups, and they encourage others to get involved to expand the conversation. “I hope that more dialogues pop up on campus or that this program is able to expand. It’s doing great work,” Reed said. To that end, Davison issues an invitation to any student who might like to participate, no matter what his or her perspective may be—in fact, the more diverse the perspectives, the better. Learn more about participating in an IGD.